Brian Malarkey can still cook fish, and he does so really well. Despite the pressures of celebrity and the exigencies of managing a rapidly expanding (and contracting) restaurant empire, the mako shark with crispy onions at Searsucker (611 Fifth Ave., Downtown) serves as a reminder to those who ate at Oceanaire before Malarkey’s run on Top Chef: The man can cook fish. A year ago, Malarkey was flying. He was the face of the ever-growing Enlightened Hospitality Group (EHG) “Fabric of Social Dining” restaurant empire: Searsucker, Herringbone, Gabardine, Gingham and Burlap. Malarkey was the face of the San Diego culinary world, our most recognizable and marketable figure. His new foodie television game show, Taste, was about to debut on ABC, and his flagship restaurants, Searsucker and Herringbone, found both critical and business success. That was then. A year later, five local restaurant concepts have shrunk to three. Gingham (a) caught on fire (literally), (b) was nearly sold to the Cohn Group and (c) subsequently shut its doors. Burlap in Del Mar also closed (only to be rebranded as another outpost of Searsucker). Four chefs left (one, Anthony Sinsay, since returned to take the helm at Herringbone Los Angeles). Searsucker was cloned in Austin and Scottsdale. Perhaps most bizarrely, EHG opened a restaurant in Entebbe, Uganda—a place more known for daring hostage rescues than high cuisine. What in the name of tweed was going on here? A Restaurant Week lunch re-visit to Searsucker suggested cracks were beginning to show. While the tomato-tarragon soup with basil pesto was, if anything, better than a year before—its deep, roasted flavor said “tomato” and did so loudly, brashly and excitedly, not unlike Malarkey’s personal style—the El Cubano sandwich and the steak salad were flawed. Where the pulled pork had been gloriously moist, it was now on the dry side. The steak managed to be both overdone and fatty. The desserts were a disaster. Dinner at Searsucker, with its nightclub atmosphere, was perhaps more revealing. 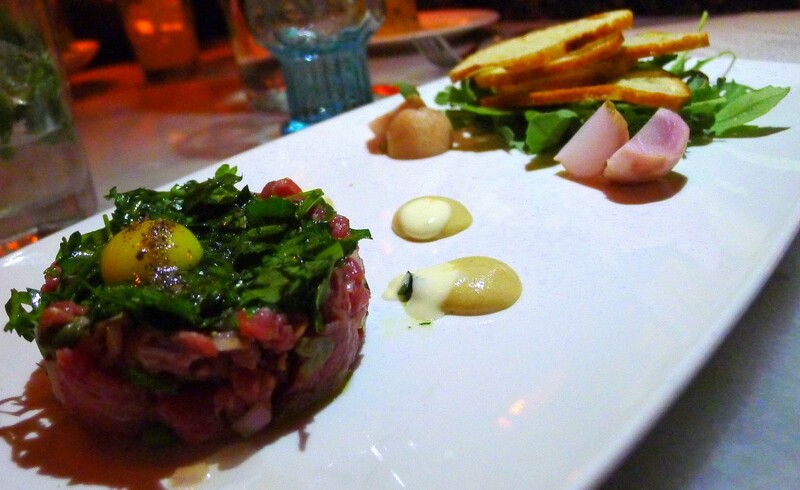 The beef tartare was well-executed, the quail egg an attractive and elegant touch and the flavors well-balanced. The crab cake with Tabasco was less successful. The lump crab meat itself was flavorful, and I enjoyed the “carb-free” feature, but it was unremittingly salty, and the capers exacerbated the problem. The “Tongue & Cheek” dish was a step back in the right direction. The braised beef cheeks were all deep, luxurious meaty goodness in contrast to the crispy bits of tongue. While the nopalesand queso fresco lent more to the look than the flavor, the pickled daikon batons were a brilliant touch both visually and on the palate, offering a hint of acidity that the dish needed to counter its richness. And then there was that mako shark. Succulent and moist with a perfect char, tomato on one side with uncharacteristically delicate sauce swirls on the other and crispy onion rings on top, this was a dish worth coming back for, a dish worth patience in the face of EHG’s turbulent year. Malarkey, it should be remembered, was a top chef at least in part because the man really can cook.